All the rest is implementation. Time is ripe to develop, market and require every target child, adult or animal to receive a new vaccine. $$$Money flows to some loyal hand picked developer who dreams a vaccine will be solutional to some health problem. It is likely this developer will be a member of the ACIP committee. Use money and influence to hand pick members of the ACIP. Most ACIP members have ties to the Pharmaceutical industry. Some are past employees or are current stockholders in the industry or are currently being funded to develop a vaccine. All are loyal to the concept that vaccines 'work' and none critically examine vaccine trial results. The decision to market a vaccine is rubber stamped here. Note this decision is a FINANCIAL decision. Order the Lobby Force to proceed. The Lobby Force, 50 groups, descend upon 50 USA state capitals and tell legislators that a vaccine has been MEDICALLY recommended. Note above that ACIP makes Financial decisions not scientific or medical decisions. Is your doctor named ACIP? Mine neither. Fifty Legislations or Public Health Departments make the public school system and local Health Departments into defacto sales agents ensuring that everyone buys this product. In the early development stages of the vaccine the CDC 'Friends' are contacted. 'Estimated' number of people infected or affected suddenly becomes a problem. CDC's estimated figures are brought to attention of the media. Media take prewritten stories and in the interest of economy both for time and advertisers comfort do not check the prewritten stories but instead print these advertisements as if they were news stories. Blowing the disease threat of interest way out of proportion to the reality. When public interest and fear are big enough promise that a vaccine is in development. Fundamental science is not important, publish that a 'vaccine', a great disease prevention, is on the horizon. Publicize the Break-through. The media publish the Break-through and urge the government to fund immediate rush creation of stocks sufficient for everyone. No one questions why it is so hard to get a culture of super-active virus to grow in barrels of waste material. 'Donate' to medical schools. Medical schools which don't teach the Pharmaceutical Industry view of how the human body works, lose funding for research and instruments, face pressure from the government. This pressure insures that graduates from Medical schools are almost all brainwashed in the belief that vaccines 'saved millions of lives' when actually reforms in sanitation, nutrition and hygiene saved lives while vaccination spread disease and increased death rates. Make sure Medical License Boards are politically correct in their beliefs about vaccines. Any Doctor, Nurse, or Veterinarian who finds out that vaccines are harmful and unneeded is usually stopped from talking due to pressure from Pharma companies, Licensing Boards, and legal liabilities. Find and fund Non-profit promotional organizations. Somewhere a parent or grandparent sees an unvaccinated child die and when someone tells them the superstition that their child's life would have been saved if the child had received a vaccine, this person begins a heartfelt campaign to get everybody to take vaccines. It seldom occurs to these individuals that their child would have died at an earlier age if it had been vaccinated. But the Pharmaceutical company loses no time in funding this organization which can make outrageous claims which even the Pharma CEO will blush at but the unsuspecting public thinks is truth. We have all seen bubble-style flow charts used by both government and industry to describe the flow of things. 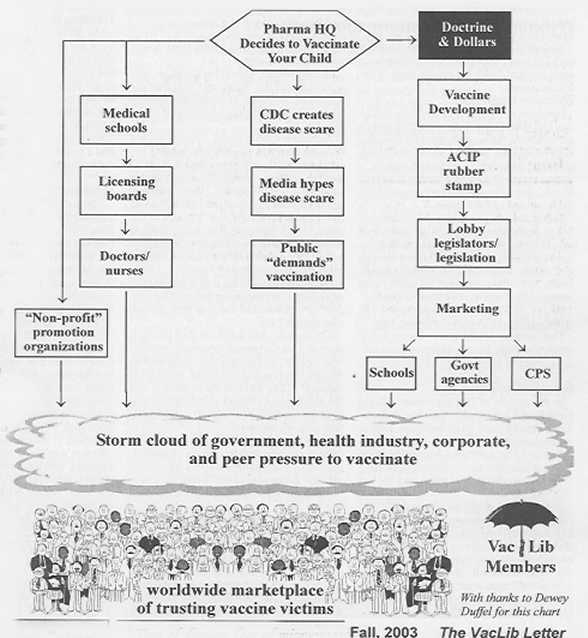 This chart, rather humorously, illustrates the factors leading to a person's decision to "immunize" themselves or their children against communicable diseases with vaccination. One must note that the chart contains no reference to science, public health, public safety or logic. Why? Because there is not one shred of science, not one event in public health history or even one statistical example to provide a logical basis for the decision to vaccinate. Greed moves the pharmaceutical companies to promote vaccination; fear moves the masses to accept them. So what do corporations in cahoots with our government gain from a sickly, fearful populace? Contemplating the answer to that question is what makes this bubble chart so interesting.